So after clearing the ambush from the road, the group decided to patrol out to scout out the location of the Kobold Lair. The patrol ran into some guards along the river and quickly set to subduing them. After several accidental kills you finally managed to capture one Kobold Guard. On the negative side one Kobold got away to warn someone named Iron Tooth. After some quick questioning you were able to determine that Iron Tooth was a Goblin which led the Kobolds inside. You also found out that there is a dragon burial site near bye where more kobolds are stationed. You discovered a sacred circle outside and discovered some treasure on the bodies of the fallen kobolds. This amounted to 4 GP 17 SP, another dragon scale and a +1 Hide Armor. The group decided to rest a while to prepare for a full assault. While sleeping the Shawna and Kitsune placed traps on either side of the waterfall. After resting the group began the assault with a bang. Alchemist fire was tossed in and while it did not randomly cause damage, it did help provide some light in the chambers. The group rushed in and fought hard, eventually defeating Iron Tooth and his Kobold allies. In the aftermath of the battle several pieces of treasure and clues were found. On the Kobolds were found 12 GP and 48 SP. On Iron Tooth a chain shirt and battle axe (worth selling). You also found a treasure chamber which held 420 GP and a +1 Suit of Dwarven Chain Mail. 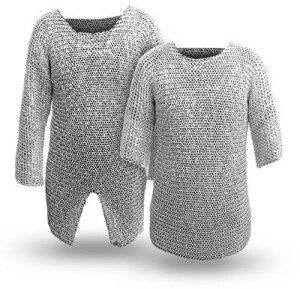 +1 Dwarven Chain Mail: This magic armor (value 520 gp) provides its wearer with a +1 bonus to AC, a +1 bonus on Endurance checks, and a daily power (as a free action, regain hit points as if you had spent a healing surge). Other things that occurred but were not discussed in game. During the extended rest you had a disturbing dream. In that dream you were caught up in a battle. Smoke filled the air and blood was spilt across the ground. You found yourselves clothed in archaic clothing and armor. Looking up a horde of thousands of orcs was coming forward. You raised your hands… and then your dream faded to other disturbing dreams but ones that were less real in some way. As real and disturbing as this dream was you were too busy preparing to storm the cave to discuss it with the others. Now a choice remains before the young group of villagers. Should you continue straight back to the village and report what you have found or should you stop at the dragon burial site to halt finding the artifact of Orcus there? What would they sell at a Google Store?